an easy and light date walnut cake. vegan and eggless recipe. chop the dates and walnuts and keep aside. line or grease a cake pan. then heat the milk and switch off the flame. add the coffee powder and stir. add the dates. stir and allow the dates to be in the milk for some 15-20 minutes or more. begin the process of sieving both the whole wheat flours and all purpose flour with salt, baking soda and baking powder. now you can preheat the oven to 200 degrees C/392 F.
take the seived flour mixture in a large bowl. add the sugar & vanilla powder and mix. add the soaked dates along with the milk, 1 cup water, walnuts and oil. mix with an electric beater at medium to high speed till the whole batter is uniform and mixed evenly. don't overdo the mixing. fold in the cacao nibs or chocolate chips. with the help of a rubber spatula remove the batter from the sides of the bowl and add it to the cake pan. shake the cake pan from the sides. place in the pre heated oven. bake the date and walnut cake for 45 mins to 1 hour or until the a tooth pick inserted in the cake comes out clean. 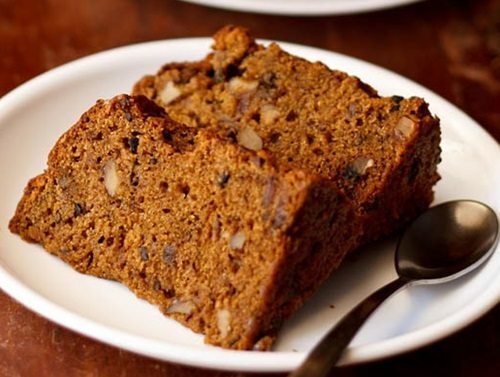 serve the date and walnut cake warm with some tea or coffee. the remaining cake can be kept in an air-tight box and refrigerated. addition of coffee and cacao nibs are optional.